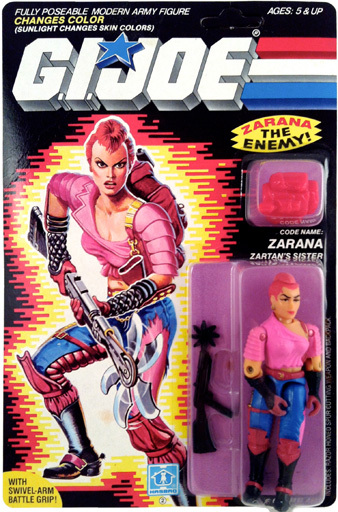 Two versions of Zarana were released in 1986; with earrings and without. See below for more on that. and the earrings were removed (seen below). The earlier version with the earrings is much harder to find. Milton Bradley released a "Live the Adventure" board game in 1986. 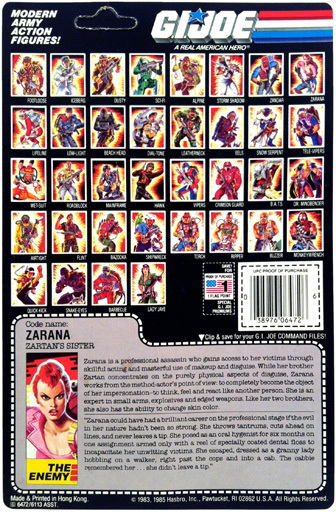 The board featured card art of characters released between 1984-87. Compare the board game art (below left) to what ended up on the final card art (below middle) and the international line art (below right): the art on the left and right features bare shoulders, a dragon tattoo, a lower cut blouse, and torn jeans that reveal flesh (not pink leggings). Have any info on this art? Join the conversation! Here's some speculation: I'm betting the art on the left and right is the original Zarana design. Before making it to production, but after creating the card art seen above left and the licensing art seen above right, I bet someone up the decision making ladder got nervous about how risqué the original was. So they toned it down by painting the thigh rip pink, raising the blouse and swapping her bare upper-arms for a copy of her brothers' upper arms (both Zartan and Zandar). I bet they argued it would help reinforce the family relationship.